Some people reckon small is beautiful but, to be honest, I'm not convinced. Thanks to that Rand character's tips special the Lab Report's been temporarily squeezed down to just two pages. Take comfort though, from the fact that hopefully (cross my fingers, chuck salt over my shoulder, touch wood, kick the Geek six times, and one extra for luck) it'll be back to its full quota next month. Until then, happy adventuring . . .
ou are Arthur. Not Arthur Fowler, Arthur Scargill or even Arthur I'vegotakipperstuckupmyassortedsocks. 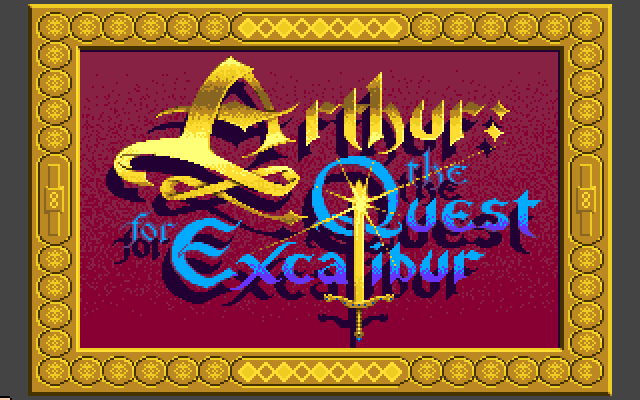 No, as just plain 'Arthur' you're the rightful heir to the English throne, and the hero in Infocom's interpretation of the famous legend. It has been many years since King Uther has died and so far no-one has been able to pull the famous sword from the stone to become his rightful heir. It has even got to the point where the people are willing to let a usurper, King Lot, take the throne. 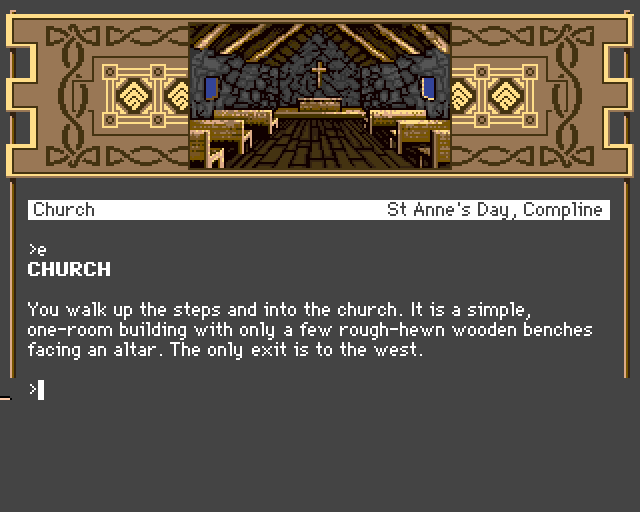 As Arthur, you start the adventure at night in the churchyard where the sword in the stone is located. You know that King Lot has imposed a curfew and you'll be thrown in jail if caught, but you were compelled to try to remove the sword. 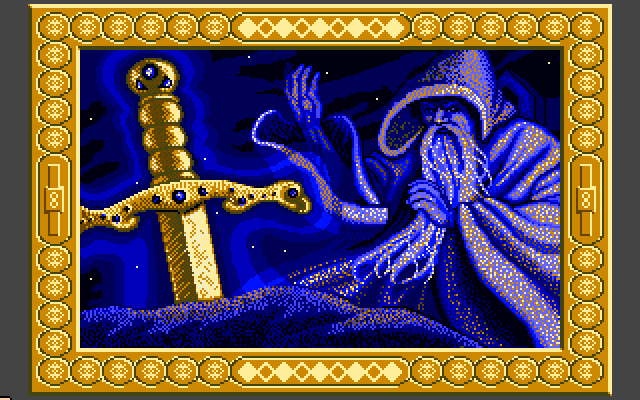 Of course, being the rightful heir, you succeed in pulling it out (no oo-ers here please) whereupon Merlin materialises and, before disappearing again, tells you that you're not yet worthy to claim the throne and must first gain a hundred chivalry, experience, wisdom, and quest points. But no sooner than Merlin disappears than King Lot's soldiers march into the church to remove the sword and stone. In the morning King Lot shows a copy of the sword to the gathered villagers, claiming it is the magic sword and that he must now be crowned High King. You must work quickly if you are to stop him -- his coronation is in three days time. 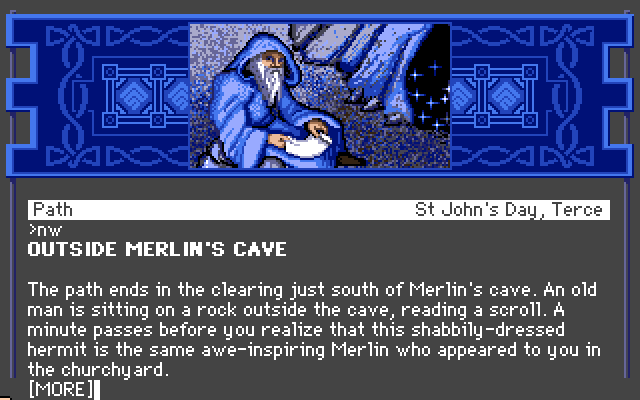 A visit to Merlin's cave results in him giving you the ability to transform yourself into an owl, badger, salamander, eel or turtle. You might've preferred a nice, shiny suit or armour and a good horse, but Merlin's Merlin and it wouldn't be wise to argue. You can change into an animal as often as you like, but never directly from one animal to another (you must become human again first), and never in public -- it would freak people out! 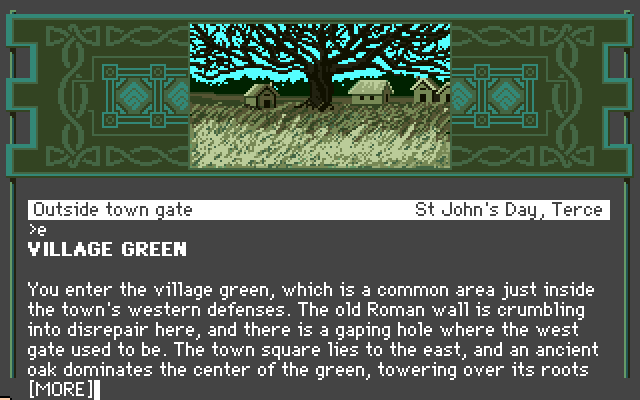 Exploring the surrounding countryside reveals a great many locations, ranging from the village tavern to bogs, woods, a lake (as a turtle or eel you can swim beneath the surface), and King Lot's castle. 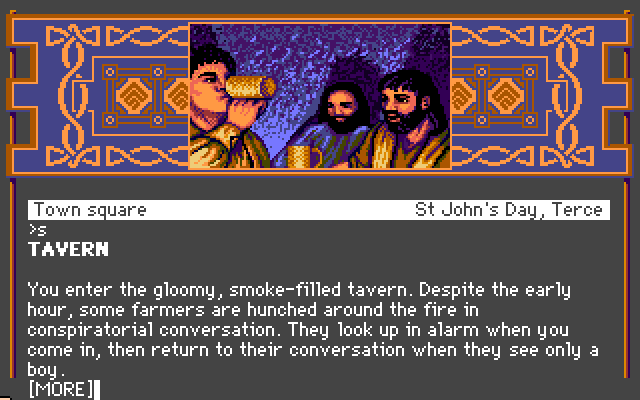 Plenty of characters, both friendly and hostile, can be spoken to and asked questions. 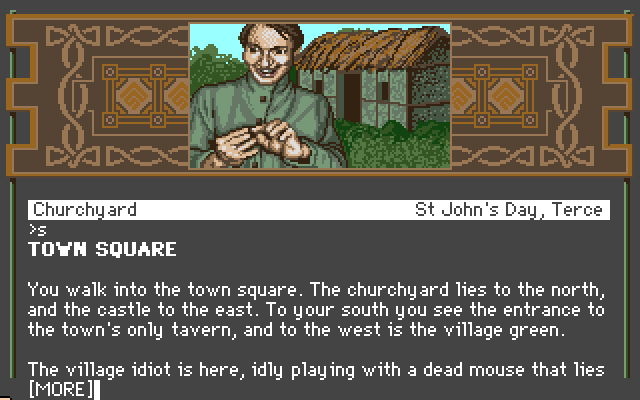 The village idiot isn't too helpful -- though he says he can peak into the game's machine code when you are gone! Most of the problems encountered revolve around transforming into different creatures -- for instance, to go down a hole in the ground you must be the badger, while as the owl you can fly high above the land. Surprisingly, as an eel you can even talk to a kraken in the lake. However, you are not allowed to carry objects when in animal form and this obviously causes more than a few problems. It can also be frustrating finding somewhere to change; there's never an empty phone box when you want one! 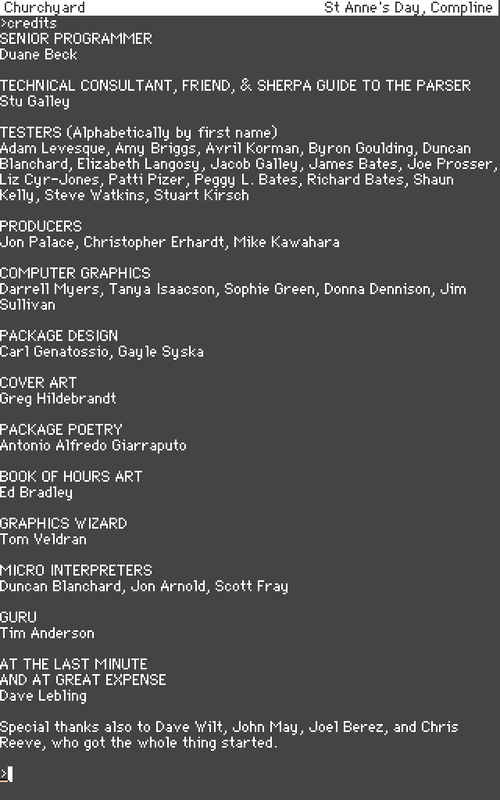 As in other recent Infocom releases, there's an in-built hints facility, accessed by looking into a magic crystal. 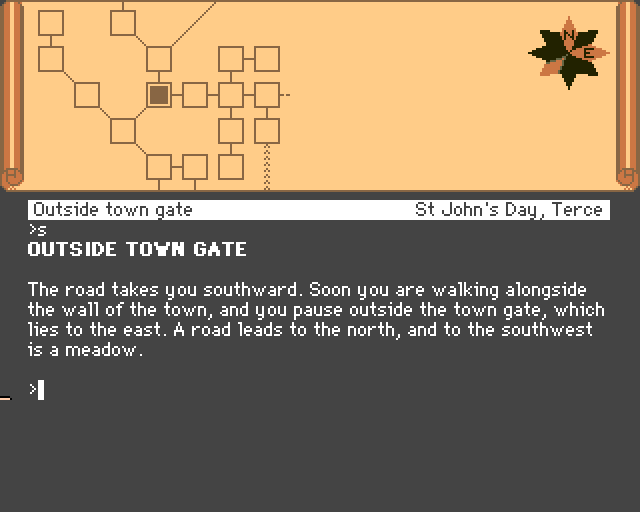 The typically polished Infocom presentation also includes various display modes: graphics, map, inventory, score, and text. With the great puzzles, some attractive graphics and a superb vocabulary and parser, plus the odd touch of humour, Arthur has all the ingredients to make a first-class adventure. A must for all Infocom fans.